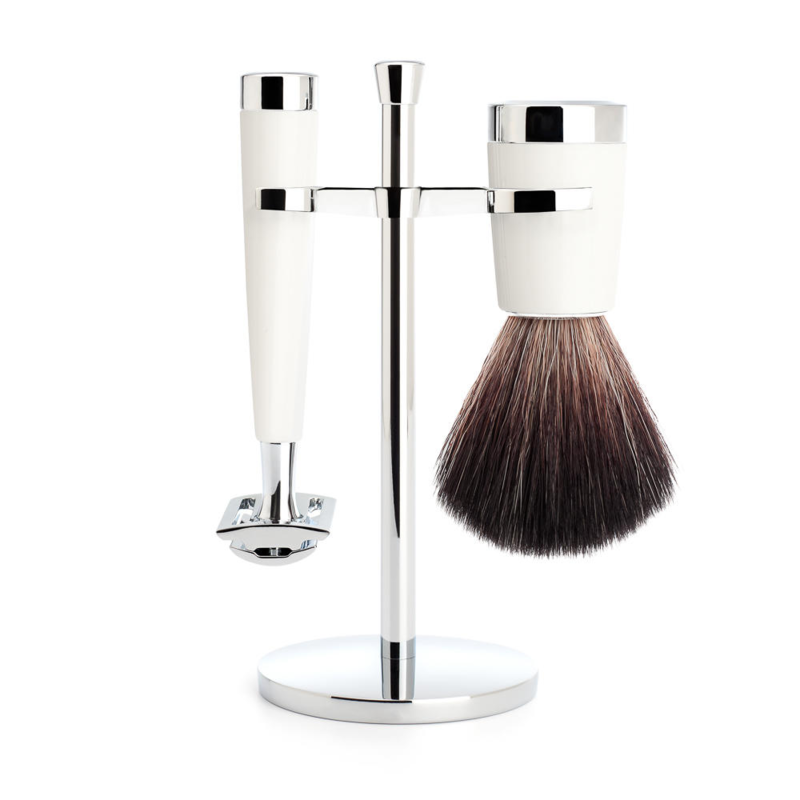 Mühle of Germany have been producing extremely high quality shaving products for over 65 years, and this beautifully elegant shaving set in a creamy ivory is no exception. The razor is lined with brass for a sturdy extra weight and will glide effortlessly across the skin, with the absence of the pulling and tugging you may experience with lower end razors. The black fiber brush, when used with a high quality shaving cream/soap is sure to create a thick lather to protect the skin whilst shaving. The stand allows the razor to be stood above ground, avoiding scratches and bacteria, whilst the brush can be hung upside down, allowing it to dry naturally. It’s also important to note that the metal components of this product are a distinct category plated chrome, visually amiable as well as giving a significantly reduced risk of rusting. 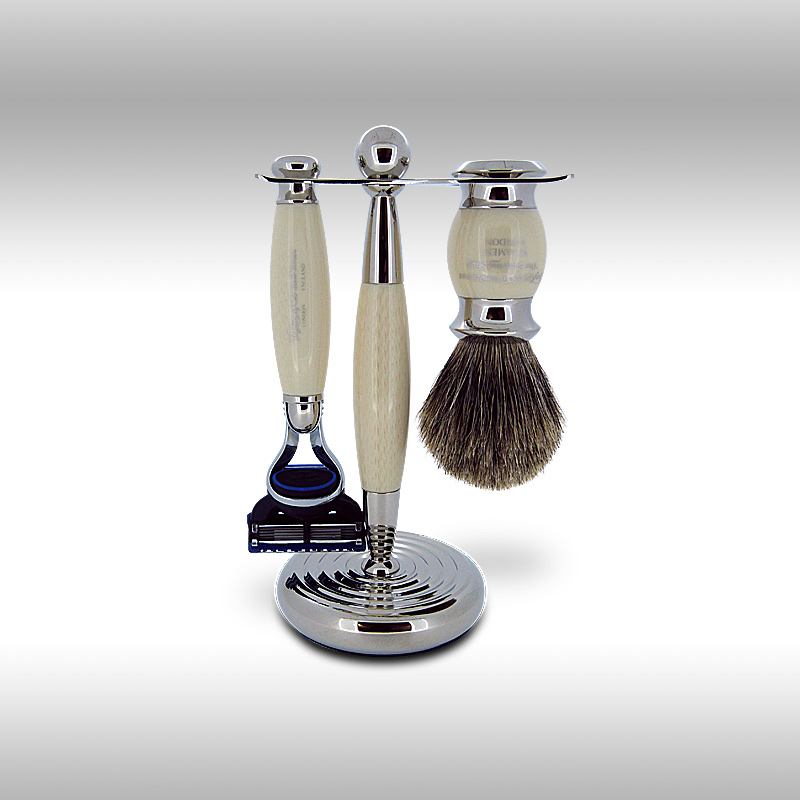 Another excellent shaving set from the masters at Muhle. 104 mm and a light 60 g, makes this the ideal early morning set for the man. Who want’s something special to wake up to. Edward’s aren’t suggesting that this fine cartridge razor and fiber brush are a substitute for a girlfriend or wife. 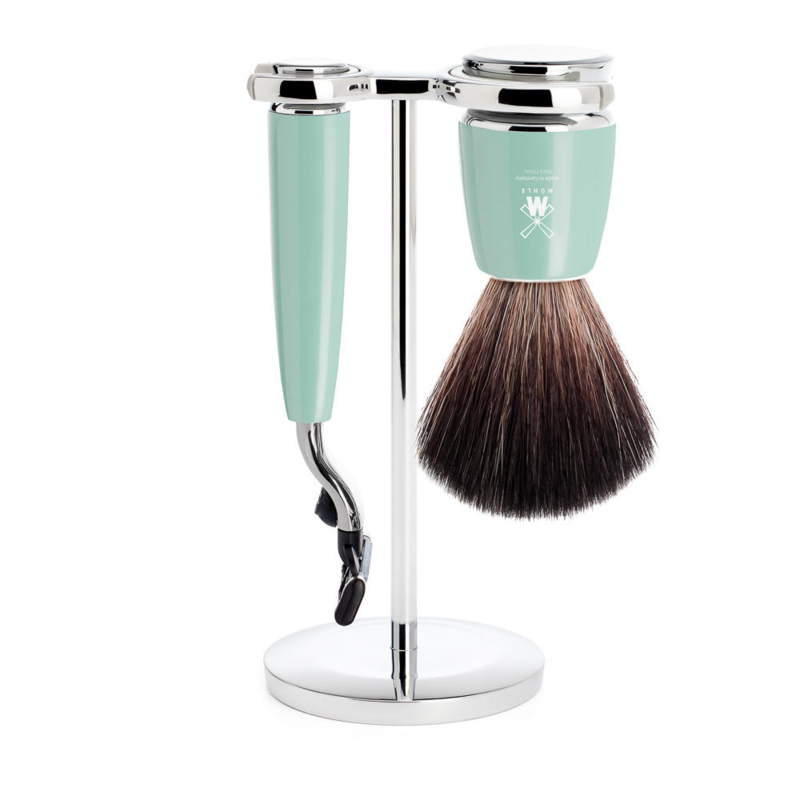 But to be fair this shaving set will never leave you or run of with your best friend. It will just be waiting for you silently every morning. Glistening and waiting for you to make yourself be all you can be for the forthcoming day. In it’s Intirety. Although not a safety razor, which aren’t for everybody. This razor and brush will will cater for the quick shaver in the morning who want’s to be efficient like he is in his Job. Whatever that may be doing. The great thing about cartridge razors is, you can really hammer advanced shaving techniques with them like the gillette slide or the blade buff. The blade buff is handy after a music festival you can literally mow off the week stubble. You just push the blade back and forward like you are buffing your face. Fiber is a great alternative to badger hair, which some people have and issue with. It is durable and will provide you with an excellent lather. We particularily like the colour of this set, is it mint or is it torquise. A most lovely shade of blue whatever the name. We would love to hear from you at Edward’s, in the hope that you would stop asking stupid questions and actually buy one of our product’s. I mean we don’t sell rubbish. 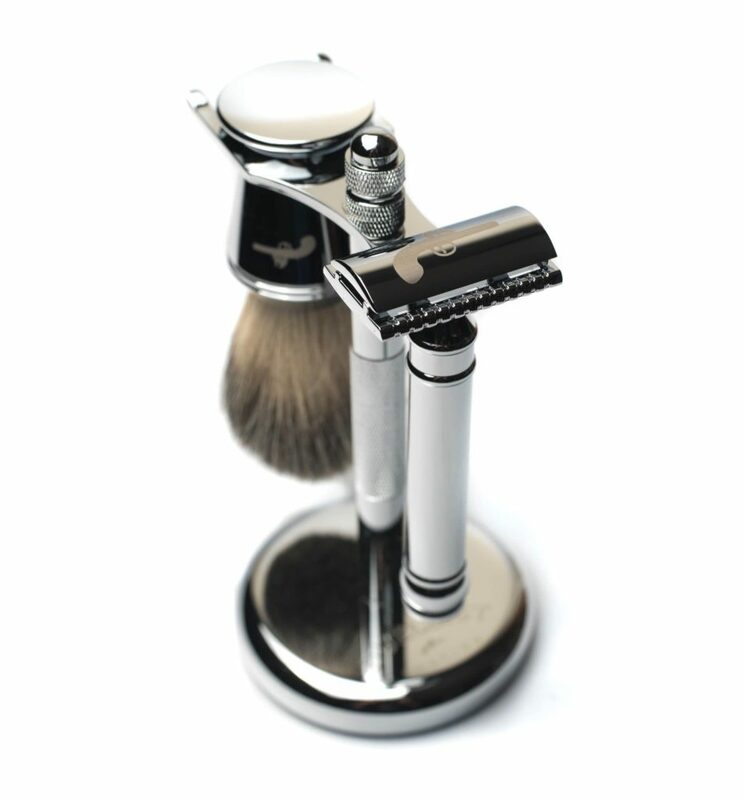 Our goods are picked from the best shaving companies in the globe. Also we will deliver the goods well quick isn’t it.